(Long Island, NY) On a cold January day in Virginia, men and women of the guided-missile destroyer USS Donald Cook’s (DDG 75) engineering department stood at attention both somber and quiet. The bitter cold chills of the wind broke the silence of their awards-at-quarters on the ship’s flight deck. While most service members eagerly await receiving awards, this was certainly not true for Electrician’s Mate 3rd Class John Chavez-Sanchez. This was the day he did not anticipate — being awarded for his bravery and assistance in the aftermath of the terrorist attack on USS Cole (DDG 67) on October 12, 2000. 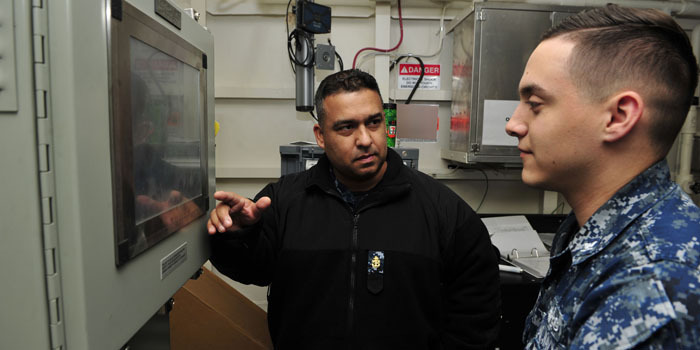 Chief Electrician’s Mate John Chavez-Sanchez and Electrician’s Mate 3rd Class Bradley Mcbrayer, assigned to Pre-Commissioning Unit Gerald R. Ford (CVN 78), tests the weapons elevator’s diagnostic server during a routine equipment check. Ford is undergoing construction at Newport News Shipbuilding and will be commissioned in 2016. Photo Credit: Mass Communication Specialist 3rd Class Kristopher Ruiz. On that fateful day, Cole pulled pierside in Aden, Yemen to begin refueling. It was mid-day when two suicide bombers pulled a small boat along Cole’s port side and detonated explosives leaving a 40 foot-by-60 foot hole at the waterline of the ship. Seventeen Sailors died and another 39 were injured. While on its maiden voyage, a mere two nautical miles away, USS Donald Cook got word on the events that had took place. Chavez-Sanchez said a quick prayer. Shortly after, the CO announced Cook’s air-wing was going to provide air support. A few more hours passed, now he and the engineering department were to muster on that same flight deck in which he was awarded his first NAM. Ten hours after the attack Chavez-Sanchez was on the first rigid-hull inflatable boat to be sent to aid the vulnerable Cole. Aboard Cole, Chavez-Sanchez and his group were asked if they could handle the situation. Again, everyone raised their hands in agreement. Some grabbed a flash light or a radio, but all of them applied a small amount of vapor rub right under their noses to combat the smell. At that sight, the 21-year-old Chavez-Sanchez realized the magnitude of the situation. He responded with a sense of duty by volunteering for anything he could do — fighting fires, dewatering flooded spaces, standing shoring watch, and security watch. However, his primary mission as an electrician’s mate was to bring up the generators and restore power to the ship. Chavez-Sanchez and the many who volunteered from the Cook began a watch rotation of 48-hours on, 48-hours off, serving time and standing watch on both missile-guided destroyers. A week into his new watch rotation, Chavez-Sanchez and his engineering team restored power and ventilation aboard Cole. Two more weeks passed and Chavez-Sanchez and his Cook team finished their damage control efforts and headed back to the Cook permanently. The Norwegian semi-submersible dry-dock ship Blue Marlin came to transport the Cole back to the United States after the on-site repairs. Alongside the Blue Marlin, Cook was again tasked to aid the ship — this time escorting Cole back to the U.S.
Once the Cole was home she began her intensive repairs and eventually became deployable again. Within the same year of the 18-year anniversary, Chavez-Sanchez’s story came full circle. While Chavez-Sanchez may never forget, he is now ready to share his story so that it may inspire his newest shipmates on the Ford with the camaraderie and brotherhood he formed with his former shipmates in the wake of the Cole tragedy.